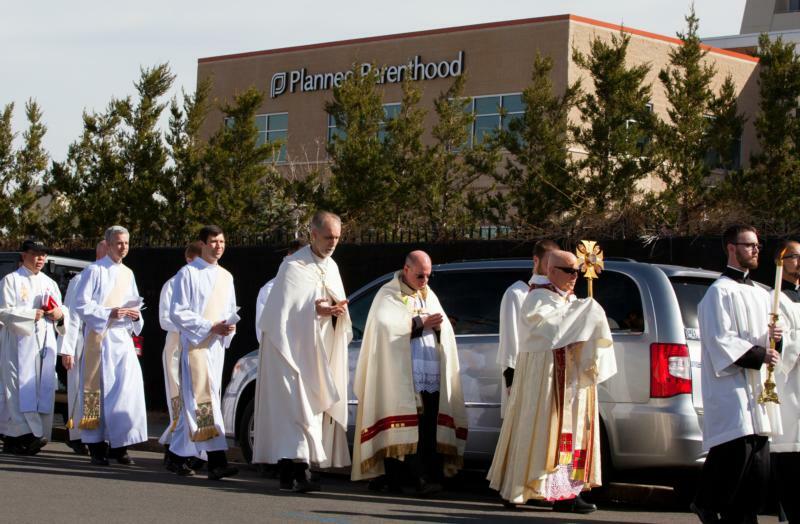 On the morning of March 5, the procession went seven times around the abortion clinic, essentially surrounding the facility with silent prayer for over an hour. March5 from Archdiocese of Denver on Vimeo. Planned Parenthood of the Rocky Mountains, located in the city’s Stapleton area, also is a regional headquarters and includes Planned Parenthood affiliates of Colorado, southern Nevada, New Mexico and Wyoming. The archbishop announced his intention to lead the procession in mid-February, and the response to the event was overwhelmingly positive, said Karna Swanson, communications director for the archdiocese. “We set up a simple website with a no-nonsense invitation for people to come and pray with the archbishop, and immediately we were hearing from people just thanking the archbishop for doing this,” Swanson said. According to the Denver Catholic, the archdiocesan liturgy office set the tone for the event to ensure the sacred nature of the eucharistic procession. It organized the logistics of the transferring the Eucharist to the site and provided prayer books for those in attendance. Before the procession began, Father Scott Bailey, who is secretary to Archbishop Aquila, addressed the crowd and emphasized the importance of silence. “Silence is an essential part of the procession as we unite our voices with those who have been silenced by abortion,” he said. Seminarians from St. John Vianney Theological Seminary led participants in hymns and prayers each time the procession passed around the building. They also assisted with crowd management. 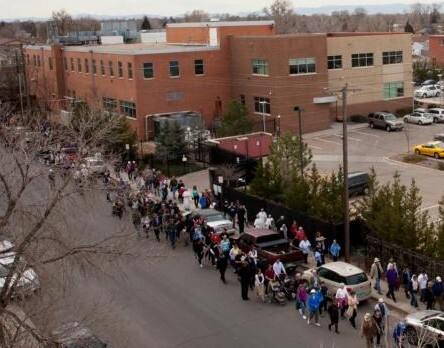 “We were honestly expecting 500 to 800 people,” Swanson told the Denver Catholic. “Three times that number showed up. This provided a bit of a challenge for us logistically, as 1,800 people don’t exactly fit on the sidewalk of a city block. Though the procession spilled out into the street, local off-duty police officers were there to make sure it didn’t impede traffic or prevent cars from entering or leaving the facility. Swanson described “wonderful teamwork on the ground” with the seminarians, members of a cycling group, police officers and participants. The crowd included a number of families with young children as well as religious sisters serving in the archdiocese, including Dominican sisters of Nashville, Tennessee; Carmelite Sisters of the Sacred Heart of Los Angeles; the Sisters of Life; and the Missionary Sisters of St. Charles Borromeo. Dozens of seminarians were on hand from both of the seminaries of Denver, as well as many members of the clergy. The Martinez family from St. Augustine Parish in Brighton was one of many families in attendance. Jaime Martinez, along with his wife, children and parents-in-law, came to the procession to pray as a family for the end of abortion. “We came here to speak for the unborn children who are getting aborted every single day here, and to pray for those mothers who are thinking about aborting their children so they can think about walking a different path and choosing a different option,” Martinez said. Contributing to this story was the staff of the Denver Catholic, newspaper of the Archdiocese of Denver.